I’ve been re-living my misspent youth in a variety of ways the past week. For one thing, a number of recent conversations have involved the old role playing game Dungeons and Dragons, or at least the old Second Edition that I played. For another, I found a Yahtzee app for my iPhone and have been playing it obsessively. My mother taught me to play Yahtzee (or, I guess, since we played a variation and weren’t using the official Hasbro rules and score-sheet, I guess we were playing “Yacht”) when I was young. Maybe she thought it would be good exercise for my math skills. Maybe she thought it would be a good way to teach me the rules of probability. Maybe she just loved the game and no one else would play it with her. Whatever the reason, she taught me to play it and on many a night we’d sit there with graph paper playing five or ten games of Yahtzee. And when I say “playing five or ten games” I meant playing them simultaneously. Your roll could be used in any of the games then underway, to allow you the best chance to use every roll. Hasbro used to put out a game along these lines called “Triple Yahtzee,” but playing just three games at once was never enough for us. So, with no actual play-testing (so no guarantee) and just a little work, let me introduce you to Yahtwentee! Yahtwentee is a variation on Yacht played with d20 (twenty-sided dice, for the uninitiated). It lasts about as long as three games of standard Yahtzee (or one game of Triple Yahtzee). It’s best played with 2-5 players, but can be played with as large a group as you want (if you have the time to kill), or played solitaire to try and achieve the highest score possible. Score cards. (A printable PDF version can be downloaded from me here). Some form of scoring markers. On each turn, a player has a maximum of three rolls. After a third roll, the player must stop rolling and proceed to scoring. By number: Add up the total of any given number shown on your dice. For example, if you have three dice showing “12” you can score 36 in the “12’s” space on your card. Two “8’s” can be scored as 16 in the “8’s” space, and so on. Three of a kind: If the numbers shown on any three of your dice match, score the total number shown on all dice. Four of a kind: If the numbers shown on any four of your dice match, score the total number shown on all dice. Full House: If three of your dice show the same number and the other two show the same (different) number, score 100 points. For example: 12-12-12-3-3, 8-8-8-17-17, and so on. Small Straight: If four of your five dice have sequential numbers (example, 5-6-7-8), score 125 points. Large Straight: If all five dice have sequential numbers (example, 9-10-11-12-13), score 150 points. Crit: If all five dice show the same number, you have made a critical hit and score 300 points. 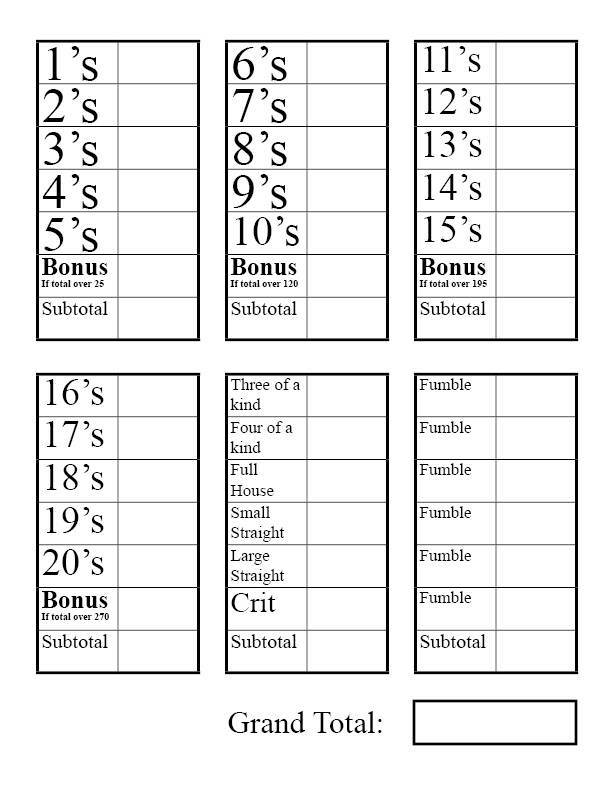 Fumble: If your roll can’t be scored in any open space (or if you prefer not to score it in an open space), you are allowed to score it as a fumble with the total number shown on all dice. You are allowed six fumbles per game. 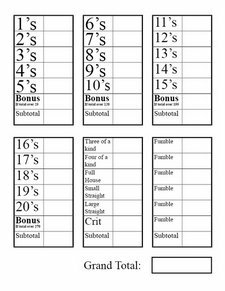 Scoring 0: It is legal to score a turn as 0 in any column if you cannot (or choose not to) score it as a fumble or in any other space. For example, say you roll 1-7-10-12-18. If you have used all your fumbles, and have already scored 1’s, 7’s, 10’s, 12’s, and 18’s, you may score the turn as a 0 under any other open space. Every turn must be scored, even if it means scoring it as a 0. Multiple Crit Bonus: If you have already rolled one critical hit and scored it in the “Crit” space, any additional crits that you may roll earn a bonus. For each crit over the first place a scoring marker on your score card. At the end of the game, each marker is worth an additional 500 points. Then you may score that crit in any vacant space (including as a Full House, Small Straight, or Large Straight). Note that if you score 0 in the Crit space for any reason before rolling a crit, you do not get a scoring marker; markers are only given for crits after one that you score in the “Crit” space on your scorecard. After every player has scored in each category, the players each total their scores. The player with the highest score wins. Have fun! If you try the game, be sure to comment and let me know how it went. Yahtzee is a trademark of Hasbro for their variation on the classic dice game “Yacht.” “Dungeons and Dragons” is also a trademark of Hasbro, or to be specific their Wizards of the Coast division, for their role-playing game. I claim no rights to either name.